Description: In 1909, while in the Canadian Rockies near Field, British Columbia, Charles Doolittle Walcott (1850-1927) discovered what has come to be known as the Burgess Shale. Named after Burgess Pass near the location of his discovery, the shale Walcott collected contained carbonized organisms of such abundance and age that they subsequently provided the foundation for study of the Cambrian Period in Western North America. Walcott, fourth Secretary of the Smithsonian, often took his entire family on collecting trips. 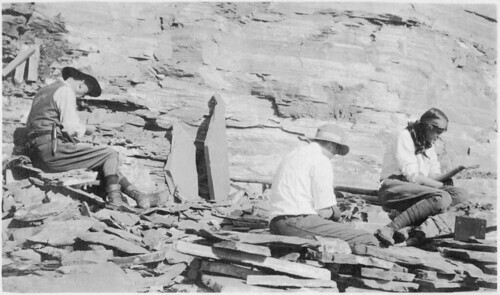 This image shows Walcott, his son Sidney Stevens Walcott (1892-1977), and his daughter Helen Breese Walcott (1894-1965) working in the Burgess Shale Fossil Quarry, c. 1913.